Beck Greener is a firm of patent attorneys, trade mark attorneys, design attorneys and intellectual property (IP) litigators. They are also CCCA members. Over the past few years they have taken big steps to reduce their environmental impact. In order to improve the firm’s waste management and reduce waste to landfill, Beck Greener asked the CCCA to conduct a waste audit and recommend areas for improvement. This entailed a review of Beck Greener’s existing waste management practices and making recommendations on the practical implementation of new practices and methods for monitoring progress and measuring success. 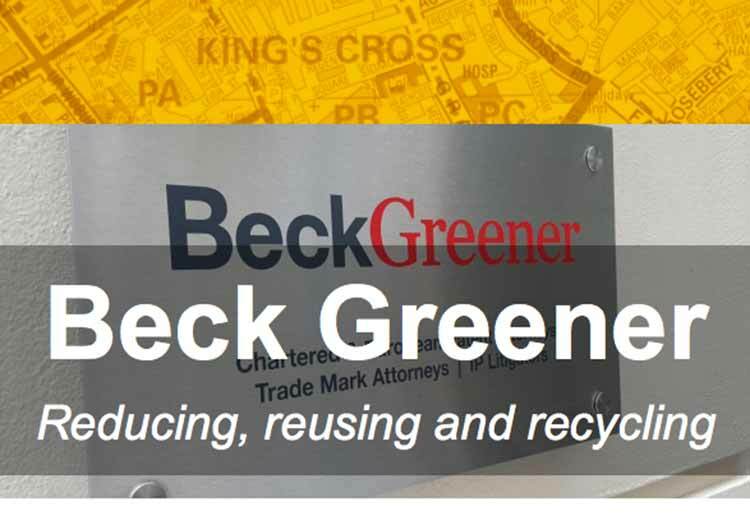 Beck Greener set a target to reduce waste sent to landfill and incineration, and increase the proportion of waste sent for recycling to 50%. They have already surpassed this target by achieving 64% recycling rate by April 2015, halving the volume of waste to landfill by implementing waste reduction measures as well as increasing recycling rates throughout the premises. This has reduced waste related carbon emissions by more than 20% equating to £215 per year in cost savings. To find out more about about their success, and plans for the future, read their full Case Study here.